Bringing chromium directly to Series 1 and Series 2 of flagship baseball for the first time as a factory release, 2016 Topps Chrome Baseball Complete Set Sapphire Edition includes a full base set and 15 parallels per box. Limited to just 250 sets, 2016 Topps Chrome Baseball Complete Set Sapphire Edition is an online-exclusive product that features all 7oo cards from 2016 Topps Series 1 and Series 2 in Blue Sapphire Chrome. In addition, each set includes 13 parallels, numbered to five copies, and 2 SuperFractors. For those that might question how the math works out given that 250 sets times two SuperFractors equals only 500 cards, Topps has revealed that the 200 subjects found in 2016 Topps Chrome Baseball will not have SuperFractors, leaving the remaining 500 subjects for inclusion in the SuperFractor set. While the Chrome name might immediately make the smaller standalone brand come to mind, the special factory set is something a little different. Of course, this Sapphire set is in addition to the more common factory sets that combine Series 1 and 2. As noted on the listing, each set comes in a box made of "collectible rigid, high-end material." Honoring Topps' 65th anniversary, the price tag is not cheap at $1,500 per box. 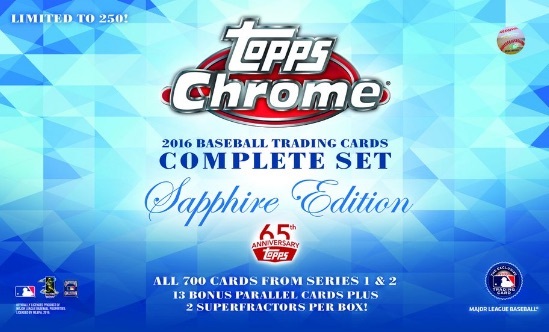 2016 Topps Chrome Baseball Complete Set Sapphire Edition can be purchased directly at the Topps Online Store.